Buttery blueberry biscuits recipe drizzles a sweetened sticky glaze and makes for the perfect breakfast treat!! Happy November 1st, Folks!!! When I lived in the DC area about 10 years ago, I frequented a greasy chicken spot by the name of Bojangles. Ever been? I believe they’re pretty popular in the south. They are known for their fried chicken and their delicious blueberry biscuits recipe. This blueberry biscuits recipe is super popular!!! 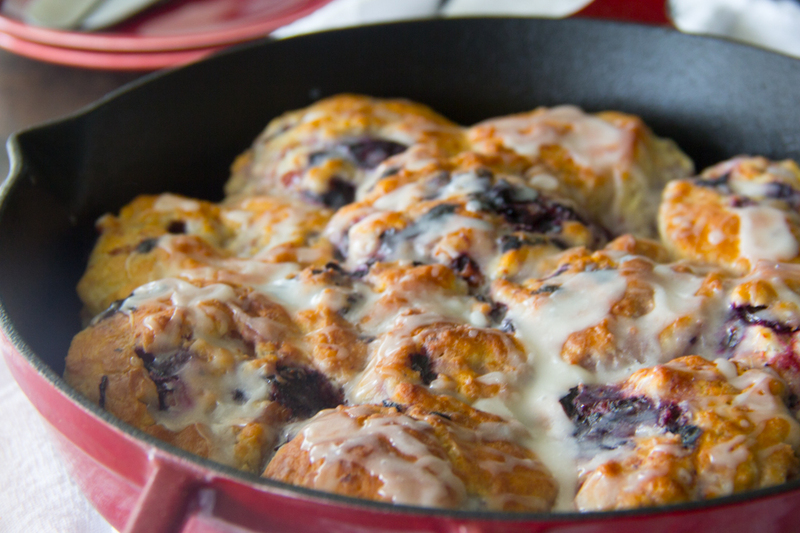 I mean who’s ever heard of biscuits with sweet blueberries baked right in?!?!?! This blueberry biscuits recipe is SO BOMB!!! This blueberry biscuits recipe was so popular with the family that Momma was rationing them out in her favor. Lol!! She’s already requested them again for Christmas breakfast. They are the perfect accompaniment to Will’s Southern Style Grits, Oven Roasted Rosemary Home Fries, Momma’s Wild Salmon Croquettes, and Oven Roasted Candied Bacon. What a breakfast spread that would be!!!! Whatever you do, be sure to try this blueberry biscuits recipe ASAP as they are so hard to resist!! They are pure comfort food!! 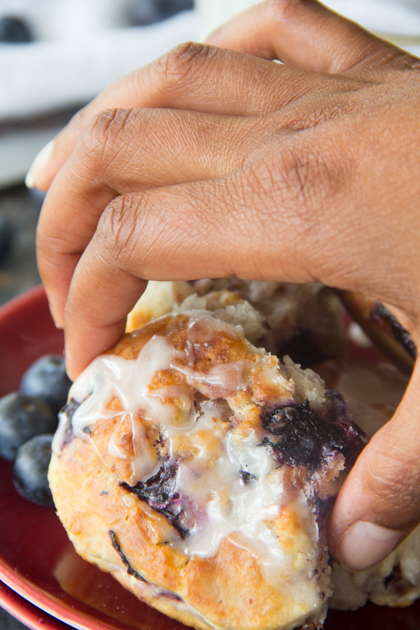 Buttery blueberry biscuits drizzled with a sweetened sticky glaze makes for the perfect breakfast treat!! Make the glaze: In a small bowl, combine all glaze ingredients and whisk until smooth. Set aside. Make the biscuits: In a medium bowl, combine flour, baking powder, salt, and sugar. Using a pastry cutter, cut in the butter until the butter is about pea sized. Slowly add buttermilk and using a fork, stir until just combined. Sprinkle your prepared kneading area with some flour. Place the sticky dough on the floured area and sprinkle with more flour. Roll the dough out and flatten to about 1/2″ thickness. Sprinkle more flour, if needed. Pour the blueberries onto the dough. Fold the dough over (sprinkle more flour, if needed) and gently knead it a couple of times and roll back out to about 1″ thickness. Sprinkle more flour, if really sticky. Using a biscuit cutter, cut out biscuits. Place biscuits in a buttered cast-iron skillet making sure biscuits are touching. Brush with milk to help them brown. Bake at 475F for about 10 minutes. After 10 minutes, brush with melted butter liberally. Place back in the oven for 5 minutes more. Once done, pour the glaze over the biscuits. Serve immediately. Say Grace and enjoy! 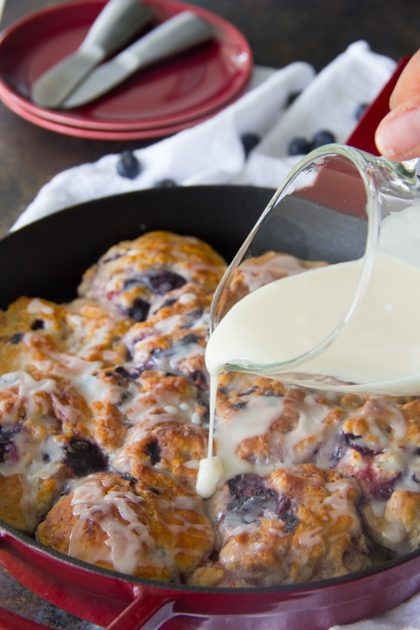 I would love trying fried chicken and these delicious blueberry biscuits! Ok, I’m from the South but have never had these blueberry biscuits — WTH? Slap yo’ Momma — these look amazing! Attach directly to my thighs! Thanks Lisa! They are superb!!! OMG these look amazing. 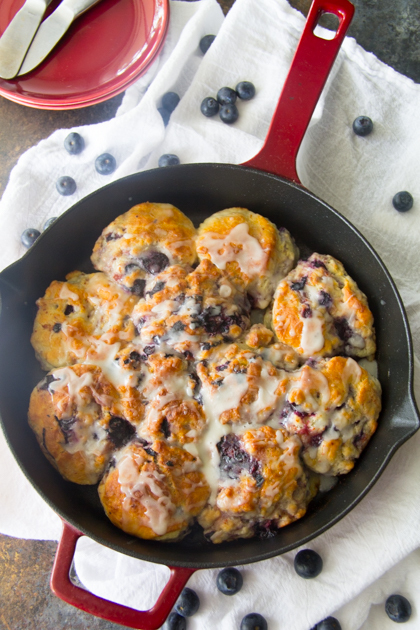 Saving this recipe for Florida blueberry season! I never heard about biscuits with blueberries, but I really like this idea. 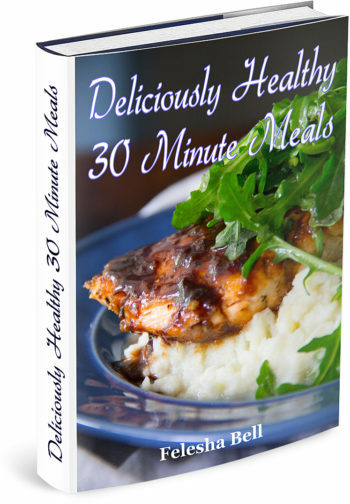 I have to try this recipe asap. I’ve never been to Bojangles before, but I’m pretty sure your blueberry biscuits must me a million more times better than anything you can get there. These look awesome! Homemade is always best!!! Thanks so much!! Felesha, these biscuits look awesome! However, I would suggest making a triple batch; eat one batch with breakfast, and turn the other two into a scrumptious bread pudding, with the addition of a custard, for dessert; and double your pleasure. Just made these and they were incredible! Turned out perfect. Soft and fluffy! I will definitely be making again. So glad that you enjoyed them as much as I do Katie!! !